Food Costs > How Much Does Alligator Meat Cost? How Much Does Alligator Meat Cost? Although many people think it’s weird to eat alligator meat, some consider it a delicacy and really enjoy eating it. Alligator meat is quite healthy, being lower in fat and cholesterol when compared to chicken. Because there are few alligator breeders available, alligators must be caught in the wild. The meat, therefore, is very hard to come by. 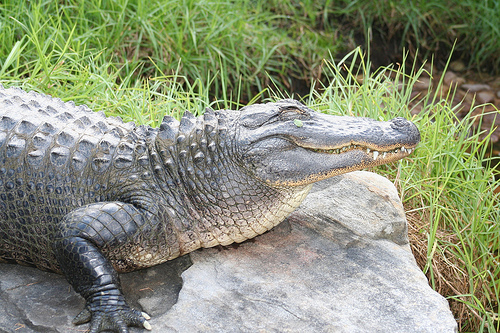 Alligators are native to only two countries: the United States and China. In the United States, the majority of alligators reside in Florida or Louisiana and usually live in freshwater environments such as ponds, lakes, or swamps. The average alligator weighs about 800 pounds and can be 13 to 15 feet long. Most of the meat comes from the tail of the alligator, a portion said to have the texture of veal but the taste of chicken, rabbit or fish. Alligator meat can be grilled, fried, made into soup or prepared other ways. In Louisiana, for instance, an alligator is commonly used in Cajun dishes such as gumbo or jambalaya. How much does alligator meat cost per pound? Because eating alligator meat is so rare, the meat can be hard to find and can cost more than other types of meat. On average, plan on spending around $7 to $20 per pound. The costs will depend on the type of alligator you want, where you live, how you’re purchasing it and how much you buy at once. A package of one-pound alligator nuggets, for example, can cost about $15 to $20 per one-pound bag. Alligator sausage or sausage links, commonly mixed with herbs and spices, can cost $13 to $17 per frozen one-pound package. If, by chance, the retailer mixes pork in with the sausage, then the costs could be about $2 to $4 less per pound. Alligator hamburger patties can sell for about $11 to $15 per pound. Alligator legs, with the bone left in, can cost about $10 to $15 per one-pound frozen package. Alligator jerky can sell for $15 to $20 per pound. Pistolettes, food similar to French bread, is stuffed with an alligator filling and is commonly found via retailers that sell alligator meat. Four to six rolls, on average, can cost $15 to $20. At the Louisiana Crawfish Company, for instance, they sell a filtered, processed and marinated alligator meat for close to $19 per pound. LA Best Seafood, LLC lists its prices on its official website. A two-pound pack of alligator wings retails for $10 per pack, whereas a pound of alligator sausage can cost $8 per pound, with a five-pound minimum. According to this Daily Mail article, the prices for alligator meat can range anywhere from $8.50 to $22 per pound. 3.5 ounces of alligator meat will have 112 calories, 1.8 grams of fat, 70.5 milligrams of cholesterol, no sodium, no carbohydrates and 25 percent protein. If purchasing online, most retailers will want to ship overnight. Depending on the store policy, some may charge you for shipping or may waive the fee if a minimum requirement is met. Most of the time, shipping will be $25 to $35. As with any meat, the more you purchase at once, the more you can save. For instance, buying a five-pound package of alligator meat could cost about 20 percent less than buying it individually. Shop around. Search online and you will quickly notice quite a few retailers selling alligator meat. However, don’t go with the cheapest option as the price can often dictate the flavor. Be sure to investigate the farm’s reputation and what other people have to say about it.